So the cold has finally arrived in the Northeast. Like you, all I want to do is eat warm comfort food which is generally heavy and fattening. Who doesn’t love the satisfaction of a full belly of yummy calorie dense food on a cold winter night. Periodically though you have to give your stomach and taste buds a change. So I put together this light but equally satisfying Mediterranean Salmon Quinoa Salad. The fat and most of the intense delicious flavor comes from the healthier fats in this dish. 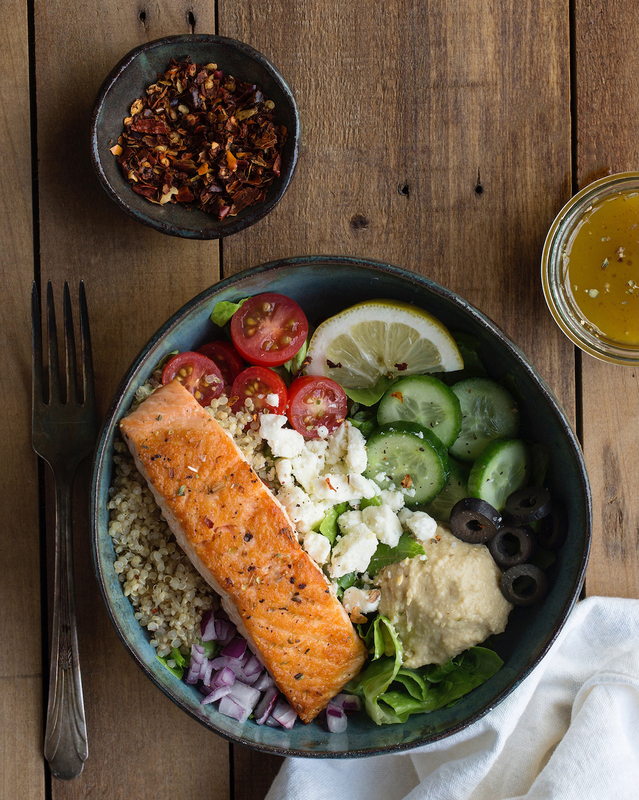 The feta, hummus, salmon, and olives are as equally satisfying without the guilt of eating heavy cream laden or fried food. Additionally, the quinoa, lettuce and flavorful vinaigrette add the freshness and acid, which coupled with the oregano sprinkled throughout the dish makes this a super delicious salad. Heat up the oil in a large pan on a medium heat then add in the salmon. Season with salt and pepper. Cook for about 4 minutes on each side, until nicely browned on the outside. Cook the quinoa according to the package directions then allow to cool. Meanwhile, in a small bowl combine olive oil, red wine vinegar, lemon juice, lemon zest, and oregano, to make the vinaigrette. Toss the lettuce with some of the vinaigrette and then divide into 4 bowls. In each bowl, add small groupings of the quinoa, cucumbers, tomatoes, red onion, olives, feta, hummus, and lemon wedges. Top each off with a piece of salmon. Season with salt, pepper, oregano, and red pepper flakes and serve alongside the vinaigrette.